Duck confit, or Peking duck may be the classic dishes that come to mind when one hears that duck is on the menu for dinner, but that would be too mono-cultural for Brooklyn. 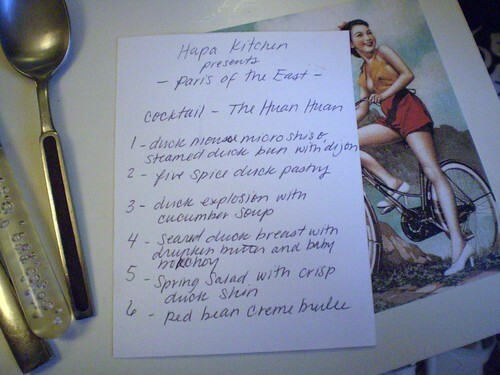 Last night, I had a fabulous dining experience, at a duck themed dinner party hosted by Hapa Kitchen, which is a group of chefs and volunteers who joined forces to celebrate the one thing that most of them have in common, being of half-Asian decent. Their focus is to create menus that combine their different culinary traditions, and if their take on duck was any indication, they are doing a fabulous job. I suggest to everyone to sign-up for their mailing list to hear about upcoming events. If the prospect of five-spice-duck-pastry with hot pepper jelly (an addictive combo of flavors that I nearly forgot to snap a photo before it was devoured), or steamed duck buns with dijon mustard wasn't enough to lure me in (which it absolutely was) I went there in the interest of supporting a supper club that was showcasing local ingredients on their menu. All of our vegetables were from Sang Lee Farms, an organic farm out on the Northfork of Long Island and all of our wine was from Wölffer Estates on the Southfork of Long Island (aka the Hamptons). They poured a different wine to complement each course, but I particularly loved the Rosé. I really do encourage people to start seeking out NY wines to support the great work that's going on in our backyard. Sang Lee Farms runs some CSAs around Brooklyn (Crown Heights and Dumbo) and a couple in Long Island as well as selling their great products at a farmer's market down by the South Street Seaport. Hot pepper jelly may have skyrocketed straight to the top of my must have list after tasting the one that Sang Lee produces. As the courses flowed and a room full of virtual strangers found so much to chat about, that the volume level in the apartment was increasingly escalating, we continued with a chilled cucumber soup with a duck dumpling. This was refreshing and light and the perfect palate cleanser for the main entree. I love cucumbers and cucumber soup in the summer, but this was the best one I can remember having in a long long time. 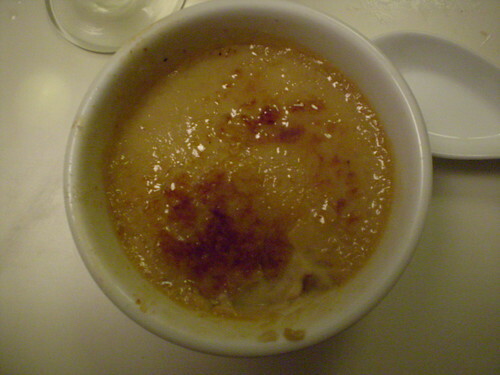 It had texture, rather than being pureed to a smooth consistency, which I think added something unexpected and made it into more of a cool cucumber sauce for the rich duck dumpling. For photos of this dish and the delicious buns I mentioned, you can check out the blog MortaDiFame written by this amazing girl Jen (yes, another one) that I met at dinner, plus her photos are excellent. Moving along with dinner, the main entree was a seared duck breast which was perfectly seasoned and cooked, served with the sweetest, most tender baby bok choy. I think this course alone was worth coming to dinner for. 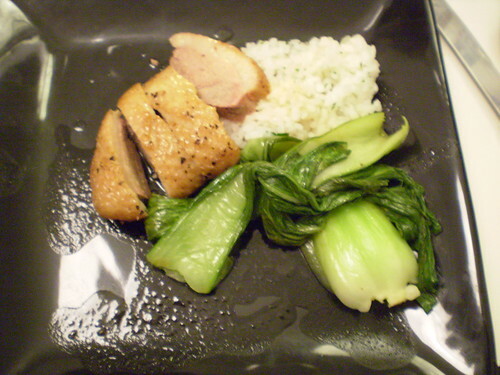 I can't tell you how many times I've tried both duck and bok choy only to find them not to my liking. 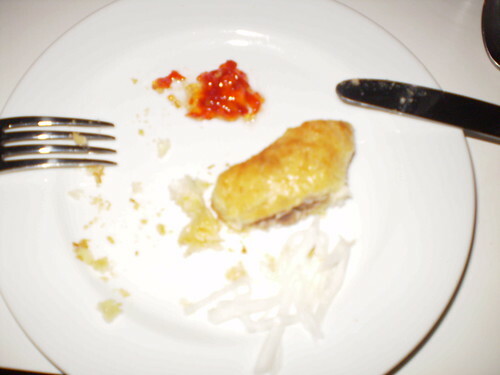 Either stringy duck that tasted of nothing but fat, or bok choy that was so bland it seemed like boiled celery. This time, I not only enjoyed them, I was sorry I didn't have a doggie bag for lunch today with more in it. 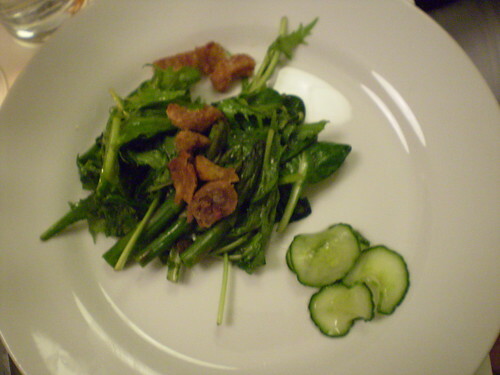 The salad course was a mixture of greens with crispy duck skin, which added a salty and crunchy component to the different greens that were dressed with a mildly sweet dressing. The crispy duck skin reminded me of Spanish-style Chicharrónes (fried pork rinds) that people sometime snack on by themselves. I wouldn't have guessed it before I ate this salad, but seriously throw some crispy duck skin on anything short of ice cream and it probably will improve it.